Best Buy Foundation- You sure made our smarty pants teens VERY happy! So excited that our local store, and the good deeds of Bart Gillespie, GM, helped us win a Best Buy award of $10,000!!! Daily STEM homework help in our 12-station Learning Technology Lab. Robotics activities, building robots from parts kits, each of which will provide the basis for exploration, team-building, and project-based learning for a team of 3. Robotics gives students many technical benefits, including developing understanding of the engineering process, documenting design ideas and challenges, creating unique solutions, mastering mechanical processes, and doing computer programming and machine tooling. These activities also develop key non-technical skills and traits, like problem-solving, teamwork, dedication, leadership, and time and project management. Students will work beside professional engineers, seeing what manufacturing and technology jobs are like, perhaps being inspired to pursue these careers. 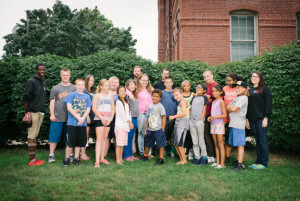 A CoderDojo, an open-source student-led computer coding club in which participants will be able to learn to code and develop websites, applications, programs, and games, with minimal instructor assistance. Kids will look to each other for answers, have opportunities to solve coding problems, and be free to jump from (code) language to language, fail, fail again, re-think, re-work, and succeed. They will learn to think critically, collaborate, and crowd source for answers. Aeronautics: building a flight station, building and testing gliders, using force to defy gravity, glider golf – pitch, yaw, and roll, designing fins to drive a straw rocket, and using pilot talk and codes. Other modules: Financial Literacy, Mathematics in Cooking, Forensics, Squishy Circuits, Food Science, Trebuchet, Catapults, and Rockets. We will present these activities throughout 2015/2016 and including the summer. We are open daily from 2:30 pm – 7:30 pm; in the summer and on vacations, noon – 5 pm.